And that’s a wrap! 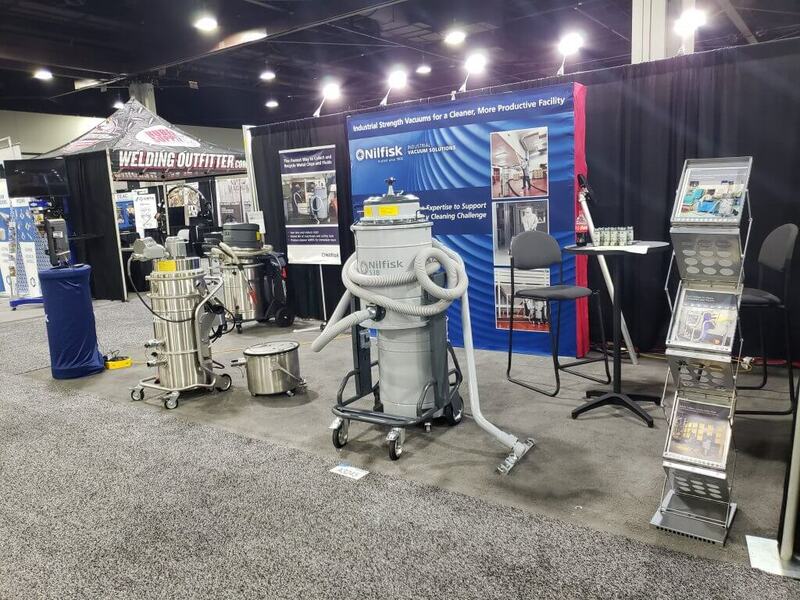 We finished up the fall trade show season at FABTECH 2018 in Atlanta, GA. Here’s a look at the Nilfisk booth and review of our most popular vacuums for metalworking applications. Visit our industry page for more models and information on our capabilities. The new Nilfisk VHS110 EXP with integrated immersion separator meets requirements for compliance with NFPA 484 for the safe collection of combustible metal dusts. The all-in-one design safely collects and renders inert Group E metal dusts, such as aluminum, magnesium and other commercial alloys, in a fluid bath. Designed for the metalworking industry, the Nilfisk VHO 200 collects metal chips, oily cuttings, lubricants and coolant spills. Constructed of 304 stainless steel, this model features upgrades including a removable collection bin, a new float system for automatic shut-off, and improved airflow performance. It is equipped with a diverting valve that reverses the flow of air to pump out the tank quickly and easily for total liquid discharge. In just minutes, mixed liquids and solids can be collected, separated, discharged and recycled. The Nilfisk S3B offers a high performance cleaning solution for a variety of wet/dry applications when only essential controls are preferred. It is ideal for many rugged metalworking applications. Run by 3 bypass motors, the S3B offers long run times with high performance and extended product life over traditional wet/dry vacs. A standard polyester star filter ensures steady, even airflow during operation, while retaining 99.1% of particles, down to 1.5 microns in size.